What is a celebration without a few games? We’ve already kicked off the hashtag game over on the other social media sites, and today I’d like to introduce you to the brand-new blog tag for this year! We’ve had lots of fun with these tags the past couple of years, so here’s a new one (though, you can feel free to to one of the old ones if you’d like. You can find them HERE and HERE. This year, I’m focusing on our favorites in fantasy. Feel free to grab these questions, answer them on your own site, and then keep the fun alive by tagging your blogging buddies! Kicking this off with a super hard question to answer, of course. My FAVORITE fantasy book. How can I pick just one? Who thought UP these questions? I look at my shelves and I start to pick one, then another. I hug them close and know that the answer is “ALL OF THEM” and how can I choose just one? Then I give up and cry a little. The Hobbit/Lord of the Rings by J.R.R. Tolkien. I know that’s cheating because it’s more than one book, but it’s my tag, so I can get away with it. 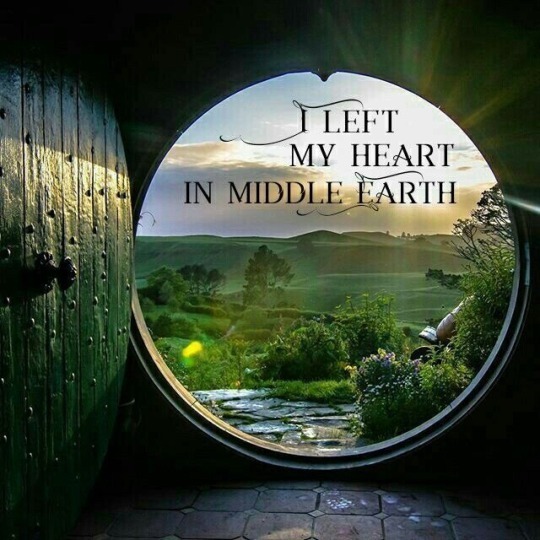 Besides, Tolkien wanted LOTR to be all one book, so author’s wishes prevail here. This one is a little easier. Favorite fantasy movie is Ladyhawke. Well, I’d have said The Princess Bride, but Ladyhawke has more fantasy elements, so I think it fits for this question a bit better. 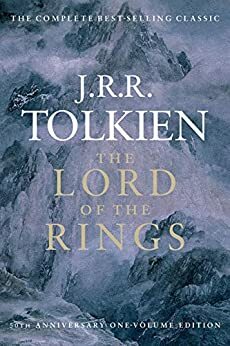 Of course I also love The Lord of the Rings trilogy dearly, and the newer The Lion, the Witch, and the Wardrobe, as well as the Hobbit trilogy The Neverending Story and SO MANY OTHER awesome fantasy movies including How to Train Your Dragon (see end of post for related awesome giveaway going on now!) and Tangled as my animated favorites, most of the Marvel and DC movies (and I’ve got a whole post coming up later this month devoted to lesser-well-known favorite fantasy films) but… at the end of the day… no matter what my mood, no matter what other movies have captured my heart… this answer remains steadfast. Favorite fantasy TV show is Grimm. Hands down, without question. **Disclaimer: Grimm is pretty dark and can be creepy, intense, scary, and overly graphic when it comes to violence… I don’t necessarily recommend it, but it is my favorite fantasy TV show** I also love Merlin, but I haven’t finished it yet… so I don’t think I can count it as a favorite until I have done that… as I’ve heard it has a bummer of an ending. My favorite fantasy hero is probably Haplo from The Death Gate Cycle by Margaret Weis and Tracy Hickman. I don’t talk about him much, because I don’t happen across very many people who are familiar with this series, but Haplo is my all-time favorite. Which is saying something! I love that he kind of starts out as an anti-villain but over time he begins to realize more and more that he is NOT the hero he thought he was, and overcomes the lies he’s been told and ultimately becomes a true hero. A few runners up would be Ben Holiday from Magic Kingdom for Sale: Sold, Eugenides from The Queen’s Thief by Megan Whalen Turner, and Chrestomanci from the Chrestomanci Chronicles. My favorite fantasy heroine is Cimorene from The Enchanted Forest Chronicles. I love her wry sense of humor, her pragmatic personality, and her go-getter attitude. If she was a real person, we’d definitely be friends in real life. Runners up would be Eowyn from Lord of the Rings, Eilonwy from the Prydain Chronicles, and Hermione from Harry Potter. This one is tough, because I tend to be drawn to secondary characters more than main ones. Samwise Gamgee is definitely high on the list. I also love Luna Lovegood, Eustace Scrubb (after he turns into a dragon, of course), Fflewdder Fflam, Rowl, and many others. I’m going to have to go with Sycorax Cavendish from The Aeronaut’s Windlass by Jim Butcher. Of all the fantasy villains I’ve read, she is hands down the most shudder-worthy! Based on the books I own… epic is my favorite sub-genre. If it has quests and prophecies and magical weapons, dark lords and something about the end of the world…. WE WANTS IT, PRECIOUS! I love a lot of things about fantasy. But my FAVORITE thing is that by and large, across genres and age-levels, magic systems and unique worlds… fantasy characters are among some of the most real, well-written characters out there. They step off the page and steal my heart as they whisk me along on their various adventures. I tend to like the magic systems where the magic isn’t really the focus. People just have it, but I don’t need to know how or why or what-have-you about it. If the magic system becomes too much of the focus, I find that it detracts from the story and the characters. (Not always, Harry Potter is a notable exception). (And before anyone brings up Sanderson, I’m just gonna say this right now… his books are EXACTLY what I’m talking about. Too much world-building, not enough character-building). I just recently finished So Sang the Dawn by Ann Marie Pavese and it was spectacular! I am planning on doing a formal review later, but for right now, this is one you definitely don’t want to miss. I like massive books, but even I can admit that most of them could have been just as good or better if the author had pruned a couple thousand words or more. Not so with this book. The story and world and characters absolutely call for the book to be the size it is. The pacing is excellent throughout and the story never felt like it was lagging or “boring” anywhere. I also don’t always love 1st person stories, but again, this story did it SO well, I kind of forgot it was in 1st person at times. Add in kidnapping, gladiators, an entire fantasy realm hidden in Antarctica, and people with the ability to turn into enormous magical lions with wings… and it all adds up to an awesome adventure. And that concludes this tag! If you like the look of this one, consider yourself tagged! Speaking of fantasy favorites, one of my all-time favorite fantasy animated films is How To Train Your Dragon. It’s about time for a re-watch… actually. And we are all SUPER excited about the new movie coming out this month! If you love this movie, you should definitely head over and check out this AWESOME giveaway of all the HTTYD-themed things! The Grand Prize is worth over $200 of amazing draconic items! Here is a “clean” set of questions so you can grab them and use them on your own blog! I plan to rave about my favorites here all month long no worries. The Death Gate Cycle is by Margaret Weis/Tracy Hickman and I chat about them a bit more later on in the month. It’s one of the first fantasy series I read on my own. It’s a very unique world… set of worlds… eh, it’s hard to explain. High Fantasy it follows the character Haplo, who has made it out of the labyrinth (a prison built to hold members of his race, they have magic so they needed a special prison) and now he’s out and has been sent on a quest of revenge, and basically to sow discord among the worlds above so that his people can take over when they get out. But over the course of the 7-book story, Haplo starts to make a few friends among the other races and begins to realize that not everything is as it seems…. and maybe his goals aren’t quite as noble/honorable as he thought. Lots of redemption threads and absolutely crazy-awesoem world-building (my husband isn’t AS big of a fan because he has a hard time suspending his knowledge of physics and engineering to truly picture the world-building aspects… meanwhile, I am not thus hindered) LOL Add to the mix dragons, and it’s pretty near perfection. Oooh, sounds like an interesting series and concept. I’ll have to look them up. Oooh, I LOVE these questions! But man, it’s going to be hard to answer them. ACK. 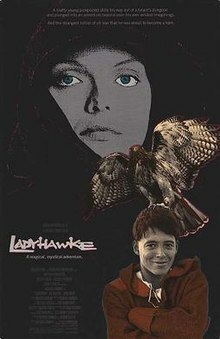 Okay so, erm, I’ve never actually seen Ladyhawke and don’t really even know anything about it. I HAVE FAILED YOU. I need to be educated! WHAAAAAAT?!?!?!?!? Oh man. Ladyhawke is…. well it’s my favorite! The movie starts with a young pickpocket escaping from the dungeons of Aquila (a sort of medieval kingdom). However, he almost gets caught again, except that a mysterious warrior in black rescues him and then explains that he needs the pickpocket to help him break IN to the dungeons so he can kill the bishop who cursed him and his beloved many years before. Magic, sword-fights, riddles, SO MUCH HUMOR, and a beautifully tragic love story… it’s superb. Yes, the 30-book long series with spinoffs totally overwhelms me, as well. A few years ago, I told Derek that a fabulous birthday present would be for him to figure out WHICH book was the first book in the DragonLance series and then get it for me. (The figuring out part was the primary gift). LOL But Death Gate Cycle is only 7 books long and has no spinoffs, so it’s more manageable. I also LOVE their Star of the Guardians trilogy (well, it’s actually four books, but whatevs) but it’s not quite as clean. Yes! You need So Sang the Dawn in your life!!! Fun! I love all your answers. I need to do this, but WOW some of them are hard. O_O I also still need to see Ladyhawke (must get to the library some century!) and look up the Death Gate Cycle which I KNOW you’ve mentioned numerous times so they must be good. Also CHRESTOMANCI AND CIMORENE AND EILONWY ETC. Yes, you need to see Ladyhawke!!!! And Death Gate Cycle! I re-read that one periodically and I still love it just as much as the first time I read it. Wow. O.O I don’t think I could answer those! Nice!